At first I thought it has something to do with the network configuration of my Virtual Machine, so I changed it from "NAT" to "Bridged Networking". Again the same exception occured. Next I thought it maybe was caused by OllyDbg version 1.10. Thus I downloaded the brand new OllyDbg 2.01 beta 2 and tried again to step over the function, but again without any luck. The following idea was that maybe the virtaul machine (VirtualBox) somehow causes the exception. Therefore I tried it on my real Windows XP SP3 system on my old Notebook, but again the same error. Another idea was it had something to do with the bot sample I was analyzing, so I downloaded a simple host resolver tool which imported the function gethostbyname(). Again no success, the same exception was thrown. My last idea was to try it on my Windows 7 VM (x86). Finally it worked and no exception occured! As you can see the call to ZwConnectPort failed with the error "STATUS_OBJECT_NAME_NOT_FOUND". Obviously that system object doesn't exist, so the call to ZwConnectPort failed and all the subsequent code also (-> Exception: 0x000006B0). By looking some lines above I saw a couple of wcslen() function calls with "\RPC Control\" as parameter and on stack I saw the string "\RPC Control\DNSResolver". 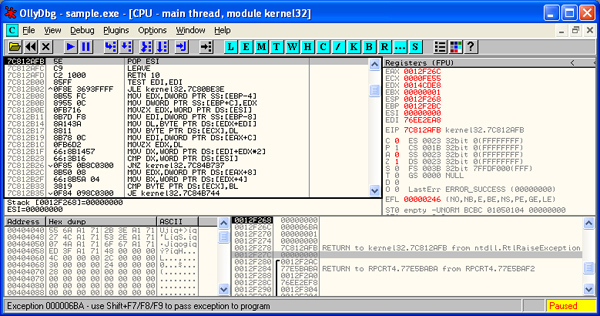 This indicated that the object "DNSResolver" in the folder "RPC Control" was the missing object. I started WinObjEx and looked at the folder "RPC Control" and there wasn't any object named "DNSResolver". A quick cross check on my Windows 7 VM showed me the DNSResolver object was there. After a search on Google I found the corresponding program which creates this object. It is the windows Service "DNS-Client" (DNS Resolver Cache Service) which on all of my Windows XP systems was set to "Demand" and the service wasn't running. But why? What immediately came to my mind is in the past I always "hardened" the Windows Services on my XP systems with a Batch script (http://www.ntsvcfg.de/svc2kxp.zip). So after manually starting the service and again trying to debug gethostbyname(), the call (step over) worked correctly and no exception occured! The case was solved. But wait, there was something I didn't understand. Why did the host resolver tool anyway completed its task and get the correct IP address? Host name resolution begins when a user uses a Windows Sockets application and specifies the host name assigned to the destination host. Windows checks whether the host name matches the local host name. If the host name is the same as the local host name, the host name is resolved to an IP address that is assigned to the local host, and the name resolution process stops. If the host name is not the same as the local host name, Windows searches the DNS client resolver cache for an entry containing the host name. The DNS client resolver cache is a RAM-based table that contains both the entries in the Hosts file and the host names that Windows has tried to resolve through DNS. When a user uses a Windows Sockets application and specifies an FQDN for the destination host and the FQDN does not match the local host name or any entries in the DNS client resolver cache, the DNS client component of TCP/IP for Windows XP and Windows Server 2003 constructs and sends a DNS Name Query Request message to the DNS server. The DNS server determines whether a mapping for the name to an IP address is stored either locally or on another DNS server. Whether or not a mapping is found, the DNS server sends back a DNS Name Query Response message to the DNS client.